Episode #83: Everyone loves a good ghost story… especially in Azeroth. 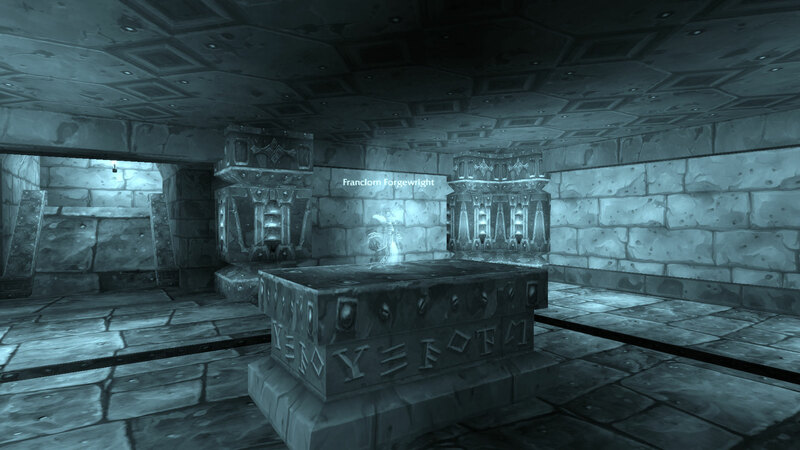 Our journey brings us to the ancient halls of Blackrock Mountain and into Forgewright’s Tomb subzone @(20.6,28.8). All explorers have the opportunity to visit a hidden NPC ghost, Franclorn Forgewright. This forgotten, level 60 Dark Iron dwarf once played an important role as a quest giver related to the Blackrock Depths instance. However, with the Cataclysm expansion, Franclorn Forgewright no longer provides ‘The Dark Iron Legacy’ quest. What makes Forgewright special is that he remains one of the few game NPCs that can only be seen by players if they are also dead. Once the visiting adventurer is in ghost form, the shadowy image of this legendary dwarf can be found standing atop his stone tomb. Although his quest is now obsolete, Forgewright’s crafting legacy lives on in the still-obtainable one-handed mace ‘Ironfoe’. This ancient mace grants its wielder two strikes per swing and the special ability to speak dwarvish for a short time. The ghost of Franclorn Forgewright – and learning the legacy of his architecture, crafting, and the existence of weapons attributed to him – is something worth revisiting. 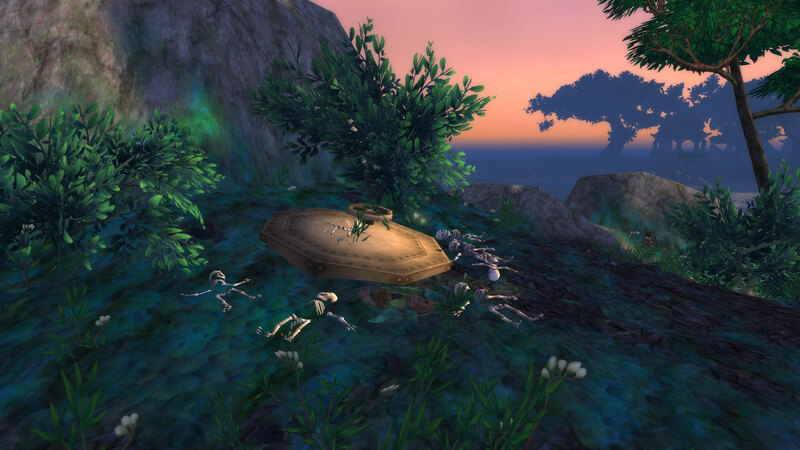 Episode #82: Daring adventurers have traveled through the Dark Portal, explored the entirety of Draenor, and constructed a personal garrison… Yet have you pondered the meaning behind the mysterious grave in Shadowmoon Valley? 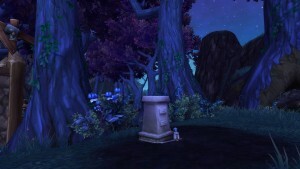 Located in the subzone of Lunarfall at coordinates @(40.3, 69.7), a solitary gray-colored stone can be found. Resting at the base of the grave, a small helm and sword decorate the memorial. A shovel is nearby – indicating that the darkened ground here was the result of a recent burial. Etched on the gravestone is the name: “Ray D. Tear”. All lost adventurers are invited to pause at this mysterious grave and discover the secret behind this raid-inspired, Warlords of Draenor “loss”. Episode #81: While exploring the northern coastlines of the Kun-Lai Summit zone, explorers should look skyward to catch sight of a wandering NPC named Lon’li Guju. This level 88, flying giant sea tortoise is friendly to both factions. 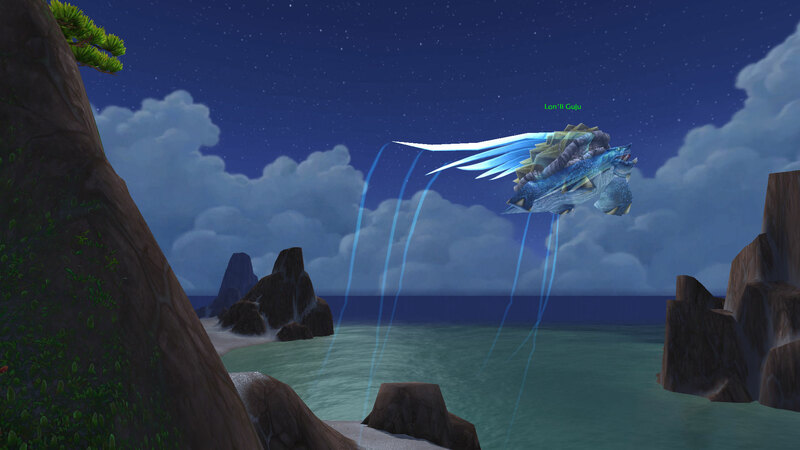 The angelic-winged Lon’li Guju is a special in-game memorial to Lonesome George, the last of his subspecies of tortoise. 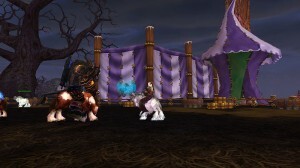 Although Lonesome George died on June 24, 2012; he now lives on forever in Pandaria. All players who befriend Lon’li Guju by issuing a affectionate emote (/love /wave /hug) will trigger a secret event to occur… because of the player’s show of kindness, this solitary tortoise will follow the player throughout Pandaria for a short while. A memorial like Lon’li Guju not only brings a warm smile to any lost adventurer, but he also stands as a noble reminder of the wise quote: “the way to love anything is to realize that it may be lost”. Episode #79: Inside the Shado-Pan Monastery 5-man instance, a mysterious graveyard conceals the location of 2 invisible NPCs, a stone shrine, and a hidden spell buff. Found on a southwestern-central mountain cliff at coordinates (46,65), the instanced Shado-Pan Monastery hides an ornately-decorated Pandaran graveyard. Explorers to this far-removed area can discover two “Shado-Pan Assassin” NPCs, named Hakka and Jae Kuen. In addition, visitors will find a solitary shrine with a bizarre, swirling light called “Unseen Force”. By clicking on the Unseen Force Shrine, players will be given a hidden buff (Unerring Blades) that grants +90% to Hit. As the Mists of Pandaria expansion ends, most players in game today will never know that these unique features can be found here… making your opportunity to see it for yourself truly ‘less traveled’, indeed. Episode #78: Off the coast of the Dreadwastes zone, an enormous NPC, named Gokk’lok, conceals a secret. This neutral, elite rare clam is found in the subzone titled the Gokk’lok Shallows at coordinates (27, 16). Although Gokk’lok shows no signs of aggression, any adventurer who attempts to attack this creature will need to defend off several waves of lvl 90 protectors. Once defeated, Gokk’lok presents a hidden quest called Promises of Gold. Unlike other quest reward items, this special vanity item – Gokk’lok’s Shell – contains unlimited charges. This bind on pickup item will cause a 2-minute buff that does two interesting things: 1) A giant clam shell materializes around your character, 2) While inside this shell, your toon appears *without* any of your clothes. The Gokk’lok Shell may be one of Pandaria’s most interesting (and conversation starting) items to ever appear in game. Episode #76: On a small island (coordinates 18,70), off the southwestern coast of Krasarang Wilds, a mighty guardian NPC elite named Cro’akan protects the defenseless critters that live upon the island. 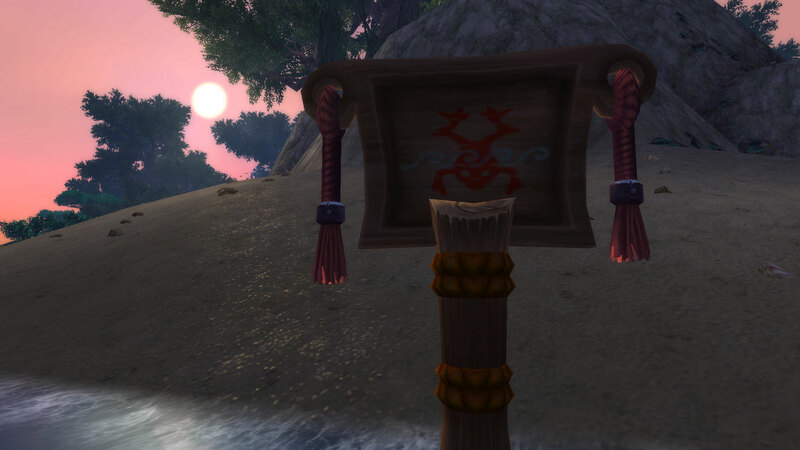 Located west of the Cradle of Chi-Ji, this island is empty of quests, NPCs, or known achievements. However, this emerald island is populated by over 75 frog critters… allowing any lost adventurer to understand this destination’s unofficial name: Frog Island. Multiple small wooden signs are posted around Frog Island’s shoreline. Each sign depicts a drawing of an ominous-looking frog diving down into the water. Previous visitors to it’s shores may have attempted to warn all travelers to beware of disturbing the peaceful critter population living here. The three varieties of frog critters – Krasarang Frogs, Krasarang Tideskirters, Krasarang Croakers – all share the same respawn pool. Due to the quick & nearly-immediate respawn nature of these frogs, this destination provides the ideal place to earn the guild achievement, Critter Kill Squad. But beware! 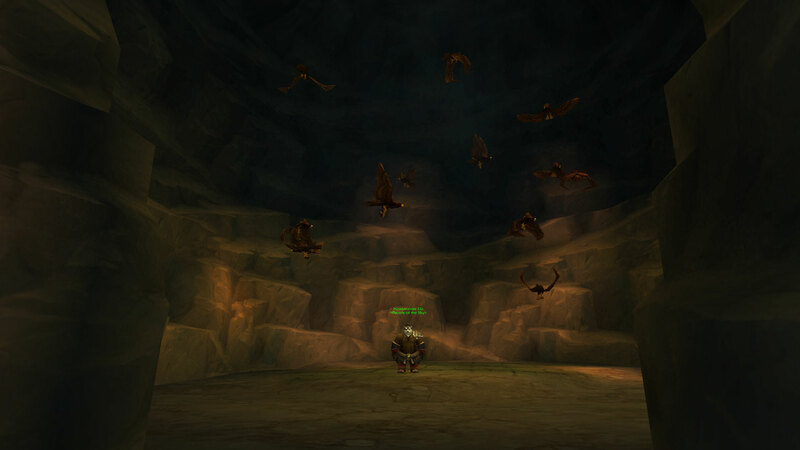 With each critter killed on Frog Island, there is a small chance of summoning their protector, Cro’akan! 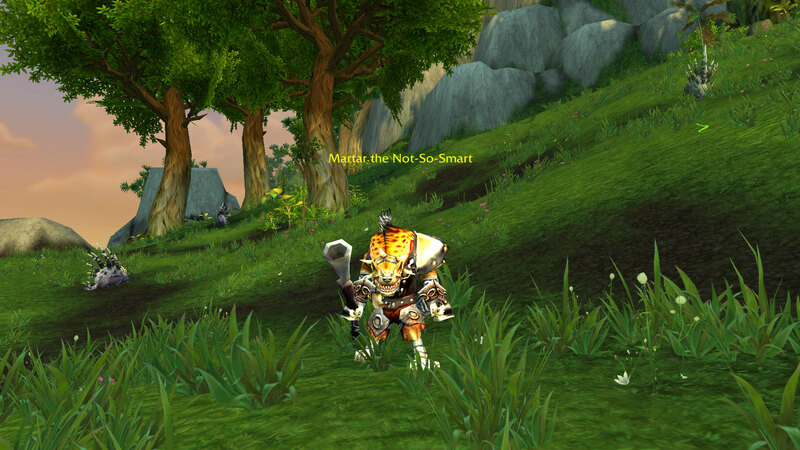 Episode #75: Found off the southern Krasarang Wilds coast, atop a rocky hill on Marista Island, a strange scene awaits every Pandaren explorer. 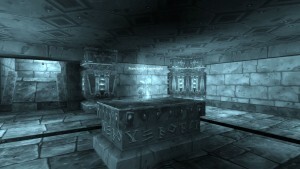 Surrounded by seven small skeletons, a large metal hatch can be discovered (coordinates 52,73). Hidden next to the hatch, a special gray-quality item called Stack of Papers, can be looted from the ground. With a vendor price of 15g, the flavor text of the Stack of Papers offers the lost adventurer a puzzle to explain the scene: “It looks like a journal of some kind. The last entry: ‘05151212:01 SYSTEM FAILURE’. What could it mean?”. This unique item may be a combination of fun references to the Diablo 3 launch failures from May 15, 2012 AND the log printout message from the TV series Lost. 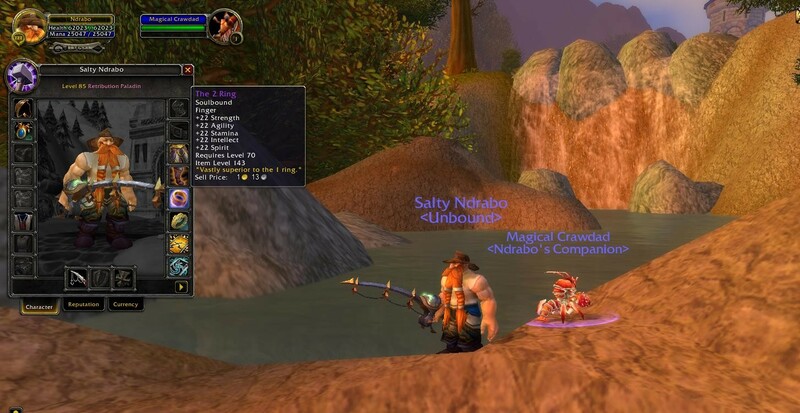 Episode #74: Over the years, Azeroth fisherman have reeled in a great number of interesting items… mostly trash, yet sometimes treasure. The crowning jewel for any angler is the incredibly elusive, ultra-rare item called The 5 Ring. This ring follows in a line of similar fishing-only discoveries: The 1 Ring and The 2 Ring. 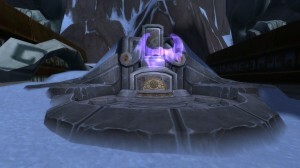 The 5 Ring can only be obtained as a reward from the Dalaran fishing dailies (Marcia Chase). Amazingly rare, The 5 Ring will only appear 3%-4% of the time inside a Tiny Titanium Lockbox, that only appears inside the Bag of Fishing Treasures 0.2% of the time. My friends, get comfortable. If you choose to try your luck at obtaining The 5 Ring, chances of getting it are as good as 1 in 46 years. Protip: Pack a hearty lunch… it may be awhile. Episode #73: Ezra “Phoenix” Chatterton, at the age of 10, was a heroic boy who fulfilled his dream of becoming a Blizzard game developer through the Make-A-Wish Foundation in 2007. During his magical day at Blizzard, Ezra helped design the Merciless Gladiators Crossbow of the Phoenix. Although originally appearing in game with the Season 2 Arena Set, this crossbow vanished from game with the launch of Cataclysm. 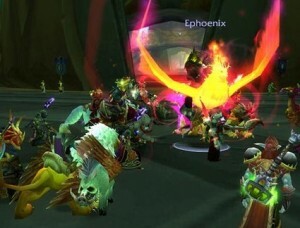 However, the Merciless Gladiators Crossbow of the Phoenix reappeared in game with patch 4.3 – available from Area 52 vendor Kezzik The Striker. My friends, we should all take time to remember the life of the brave young man, Ezra, who would have turned 16 this summer. Episode #72: Submerged under the Fizzle and Pozzik Steambarge in Thousand Needles, explorers of Azeroth can discover a very secluded goblin hideout. 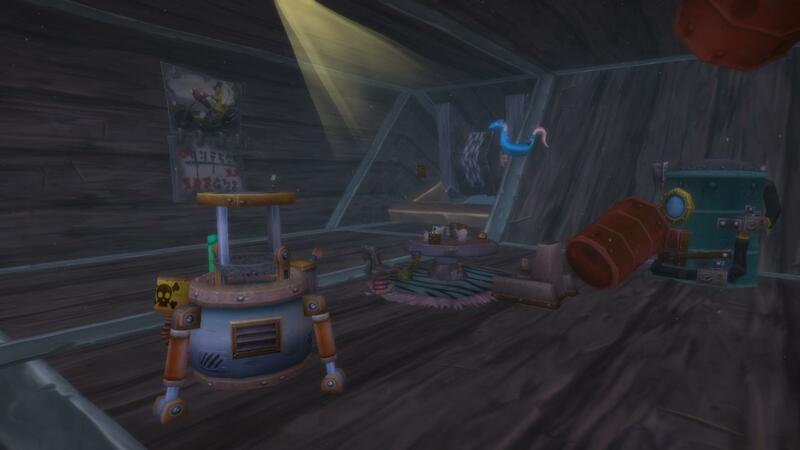 Complete with table, chairs, bubbling beverages, floating seahorse raft, and pinup calendar – this hidden room may have once been used by relaxing goblin boat-builders. Although this secret location (coordinates 77,74) has no current quest, lore connection, or NPCs; it serves as an fun hideaway for those who are lucky enough to find it. Episode #71: Throughout the history of WoW, many legendary items have existed in game for players to acquire from epic quests and achievements. However, a small number of Blizzard GM (game master) items have been uncovered and prove to be the most elusive of all. Discovered in the WoW Armory, Crafty’s Pole grants the Azeroth fisherman +1000 to their fishing skill. Peep the Outland Phoenix was one of the original 310% flight speed mounts used by GMs back during the Burning Crusade days. 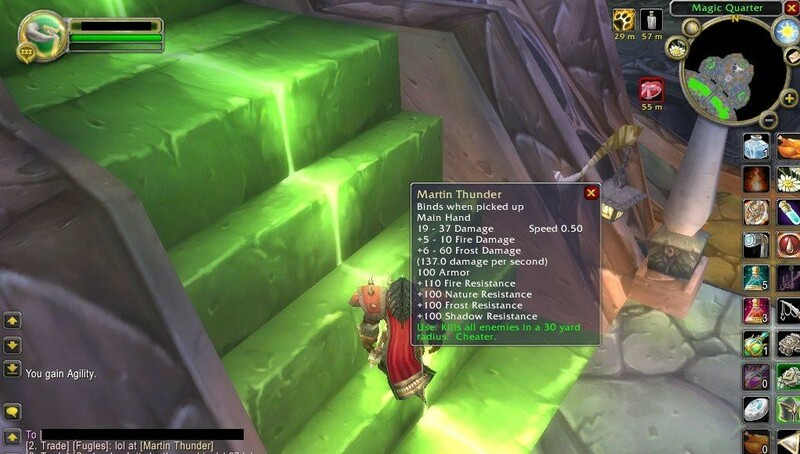 When it comes to the legendary weapon of choice, there is a good chance that the wielded item equipped by a materializing GM was an Artifact called Martin’s Thunder. 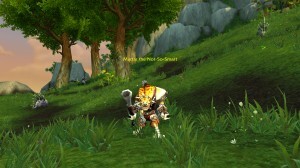 Sadly Martin’s Thunder was removed from game with patch 3.3 – replaced with the self-destructive Martin’s Broken Staff. Episode #70: Isolated on a small island in the middle of Bittertide Lake, explorers can discover a mysterious glowing hatch. Found at Sholazar Basin coordinates 38,37 – this metallic trap door is not tied to a quest chain or achievements. Closer inspection, using a mouse-over, reveals the numbers “5 9 16 17 24 43″ etched on its surface. This strange hatch is a fun reference to the American TV drama called “Lost”. On the TV show about stranded island survivors, a similar sequence of six numbers (all 1 digit off) appear on a hatch they find: 4 8 15 16 23 42. Episode #69 Lost Adventurers Journal: The Citizens of Lordaeron were betrayed by their Crowned Prince, Arthas. Years later, the empty courtyard of the Ruins of Lordaeron still hold their tortured souls. 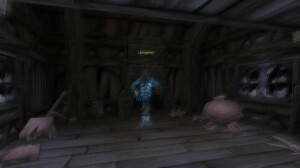 Explorers who venture into this dark courtyard, found above the present day Undercity, have the opportunity to find the hidden NPCs called the Lordaeron Citizens. 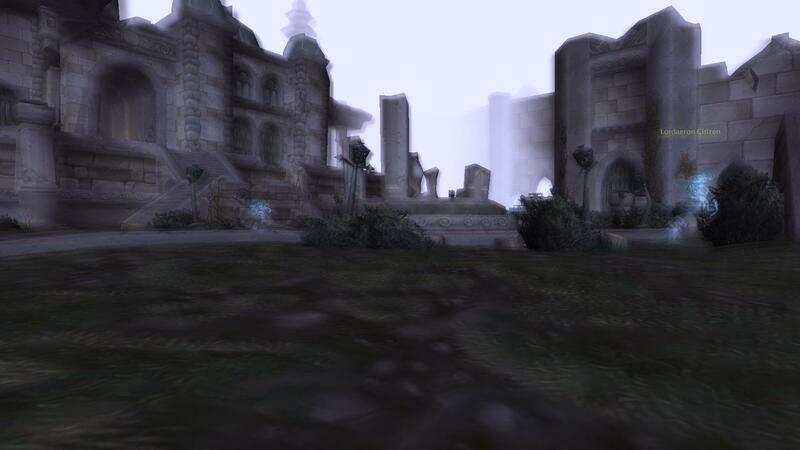 The Lordaeron Citizen NPCs, who are invisible from view without the use of an Detect Invisibity spell, haunt these ruins for all eternity. 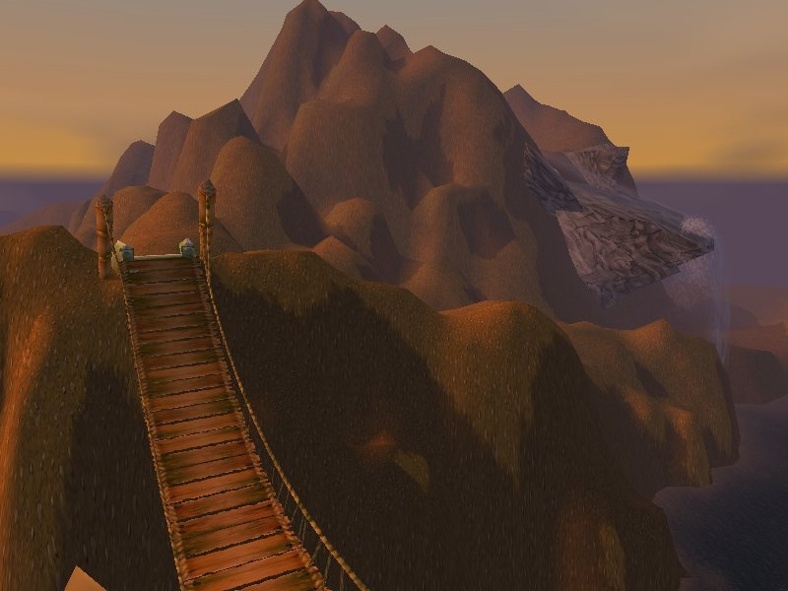 Episode #68: Gillijim’s Isle was an original subzone that existed during the alpha-testing of WoW. 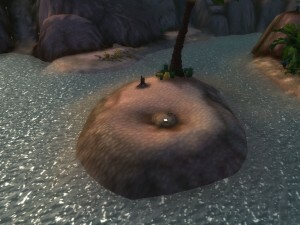 Along with the Island of Doctor Lapidis, this small tropical island was never officially released into Azeroth. 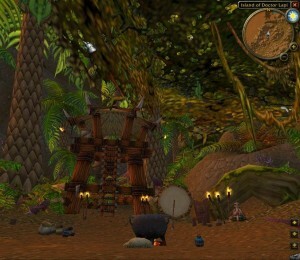 Although the island’s name may have been a playful reference to the popular tv show called Gilligan’s Island, the Blizzard developers may have initially planned this Gillijim Isle to be the starting zone for the Troll race. All reference to this forgotten island was removed with patch 4.0.1a, yet until that time, it was possible to travel to the open-water location and see the island’s subzone title appear. 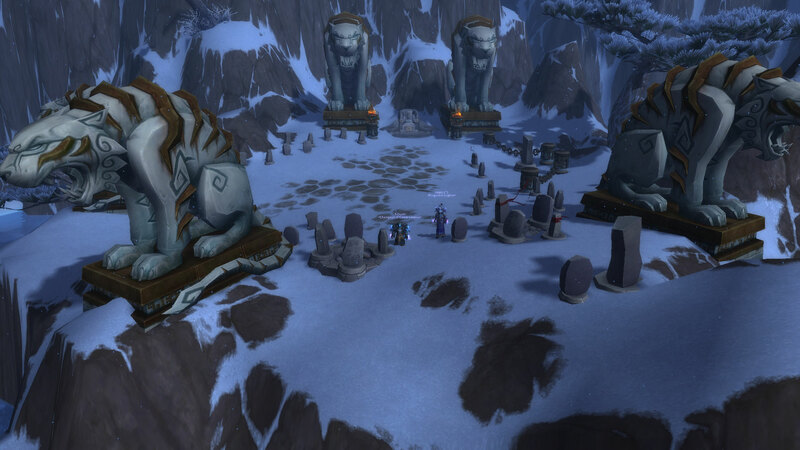 This Warcraft Less Traveled episode can also be heard as part of the All Things Azeroth Podcast from Dawnforge Productions. 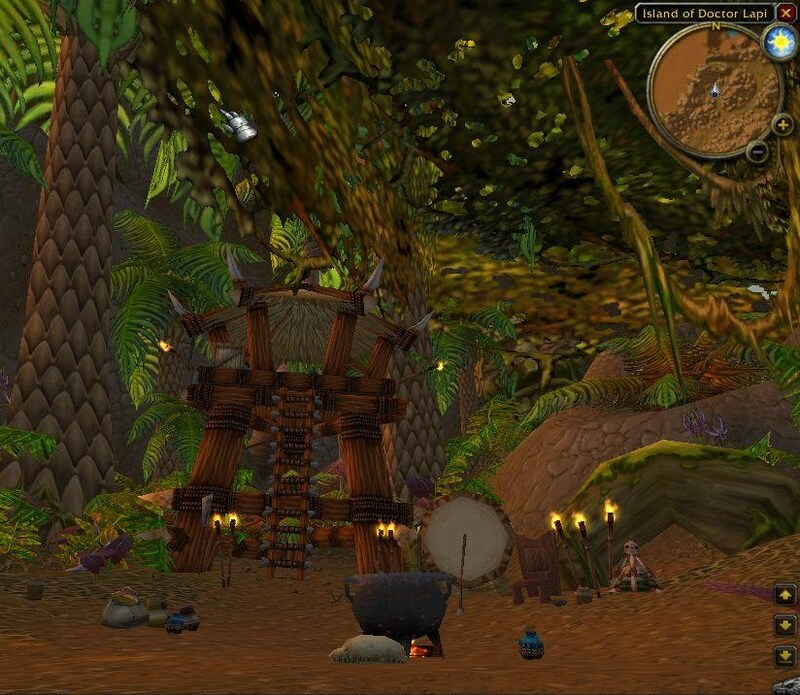 Episode #67: The Island of Doctor Lapidis and Gillijim’s Isle are two forgotten subzones that never made it past the early alpha-testing of World of Warcraft. Found in the fatigue waters off the southwestern Stranglethorn Vale coast, the Island of Doctor Lapidis may have been an early attempt for Troll-specific leveling (originally marked for levels 10-22). Appearing on a few official game maps, Doctor Lapidis island shared the standard STV landscape and environmental textures. Although never activated with quests, the NPCs found on the island included Forest Trolls, Jungle Trolls, Ice Trolls, Humans, and Naga. The Island of Doctor Lapidis was removed from the official release of WoW, yet until patch 4.0.1a, it was possible to travel to the open-water location and have the island’s subzone title appear… even though the island was nowhere to be found! Episode #66 Lost Adventurers Journal: Found in the Duskwood village of Raven Hill, a number of invisible specters haunt the shadows. The ghostly creatures, called The Unseen, are unknown to most players in Azeroth today. Only explorers who use detect invisibility (or similar) spells will have the opportunity to witness this hidden NPC in game. The Unseen live up to their name and make the old houses in Raven Hill truly haunted. Episode #65: A handful of very rare Damp Diary Pages (Day 4, Day 87, Day 512) can be found by an avid Azeroth fisherman. Contained inside a mundane Message In A Bottle, each Damp Diary Page strings together a colorful story of a castaway, shipwrecked on an island filled with bananas. Curious explorers may question whether there is a connection between the banana island mentioned in the diary and the mysterious Tel’Abim Island. 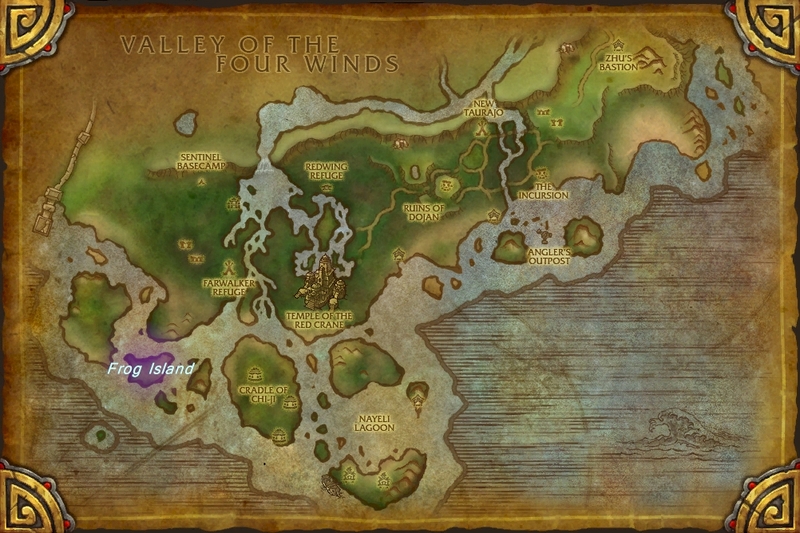 Because it appears on very few official Blizzard development maps, there is little known about the south seas island of Tel’Abim. 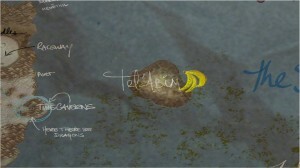 Although we cannot know for certain, these three Damp Diary Pages may be our only glimpse into Tel’Abim, the inaccessible WoW island zone where the popular Tel’Abim banana gets its name. Episode #64 Lost Adventurers Journal: A number of mysterious things are found throughout the Darkmoon Faire. Yet, explorers of all levels can acquire a pair of souvenirs that share a common theme… ponies! Learn how to earn the I Was Promised a Pony achievement for riding a special faire pony and how to fish up a rare Darkmoon Sea Pony from the boardwalk.